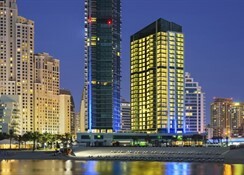 Doubletree by Hilton Hotel Dubai Jumeirah Beach is a contemporary luxurious hotel in Dubai’s scenic beachfront. The hotel offers a comfortable stay with indulgent guest amenities like a lovely sparkling outdoor pool or a strip of soft white sands at its private beach. Guests have a host of recreation options which include complimentary access to 24-hour fitness centre, soak in relaxation at the steam room, sauna and massage rooms while enjoying magnificent views of the Arabian Gulf. Close to the financial and business districts, and with a golf course where guests could tee off, this hotel offers luxurious living along with a touch of warm hospitality to make guests feel at home. Enjoy scenic vistas from the balcony or gaze at the stars, staying here will make your Dubai city break memorable. Set on a beautiful promenade, this all-suite high rise hotel is strategically located close to all attractions and enjoys proximity to the to Burj Al Arab beach. The Reel Cinema and busy thoroughfare of Sheikh Zayed Road are 1.2km away, Ibn Battuta Mall is 5km and Wild Wadi Waterpark is 16km. 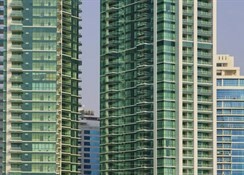 Shopping malls, good restaurants and golf courses are all in close proximity to the hotel. 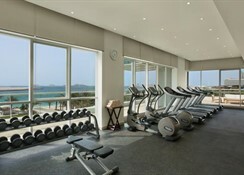 Doubletree by Hilton Hotel Dubai Jumeirah Beach has 110 luxurious suites with one-, two- and three-bedrooms. The suites are furnished with Sweet Dreams® bedding, and offer Wi-Fi, 47-inch satellite TV and bathrooms with a tub and shower. Some rooms have excellent views of the Arabian Gulf and Palm Jumeirah. 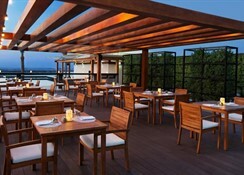 DoubleTree Jumeriah Beach has a clutch of restaurants and bars to cater to the palate of guests. 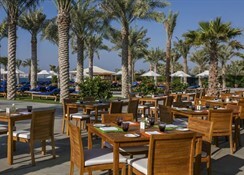 While the Kitchen Table restaurant offers a lavish breakfast buffet, the Almeeda is a place for grilled BBQ, seafood, plus a host of Arabic and international cuisine. 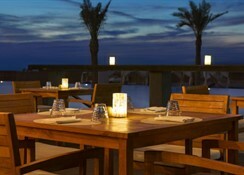 Visit the Areia, a poolside restaurant, for some fantastic views and delicious cocktails. DoubleTree by Hilton Hotel Dubai Jumeirah Beach has a large sparkling pool for the guests to take a quick dip. There’s a private beach lined by sun chairs, 24-hour fitness centre and a beachside restaurant. Being on the Walk, there are many shopping, dining and entertainment options nearby. The Ski Dubai Emirates Golf Club and Wild Wadi Amusement & Waterpark are all a short distance away. In the evenings, JBR The Walk organises fireworks on the beach. We would like to inform you that our pool has been revamped and is now open for your enjoyment as of 15th August 2018. Our common guests experience and enjoyment is our priority and as a result we will continue to provide a daily complimentary shuttle to and from La Mer beach whereby they can enjoy a day of sun, sand and sea.